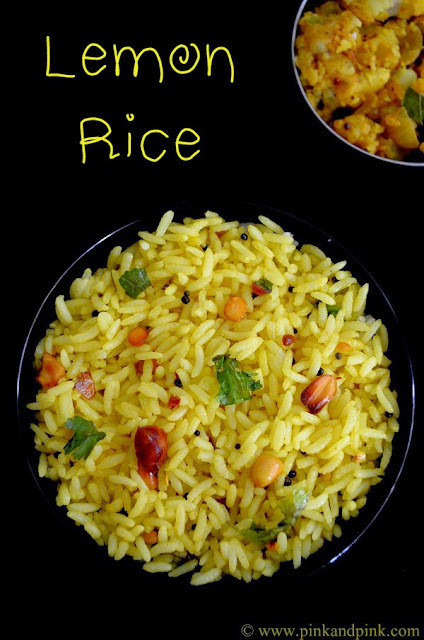 Lemon rice recipe is one of the inevitable easy recipes you must know. We call it as Lemon Satham(Lemon Sadam), Elumichai Satham in Tamil. It is called as Nimbu Rice in Hindi I believe. Even though I like to spend time to try new dishes, there are some days when I really want a break either because of laziness or tiredness. I have ready stock of puliyodharai(Tamarind rice) mix and Lemon Rice powder. But they comfortably stay for a long time in my shelf as I just keep it in case of worst case. Can the lemon rice powder mix beat lemon rice made from fresh lemon juice? Definitely not. They are helpful when you in hurry but when you have a few more seconds to spend and a piece of lemon in hand, just squeeze it and make the lemon rice from the fresh lemon juice. It is so flavorful and tasty. My hubby does not prefer variety rices initially. Now he is not saying no and he loves it. 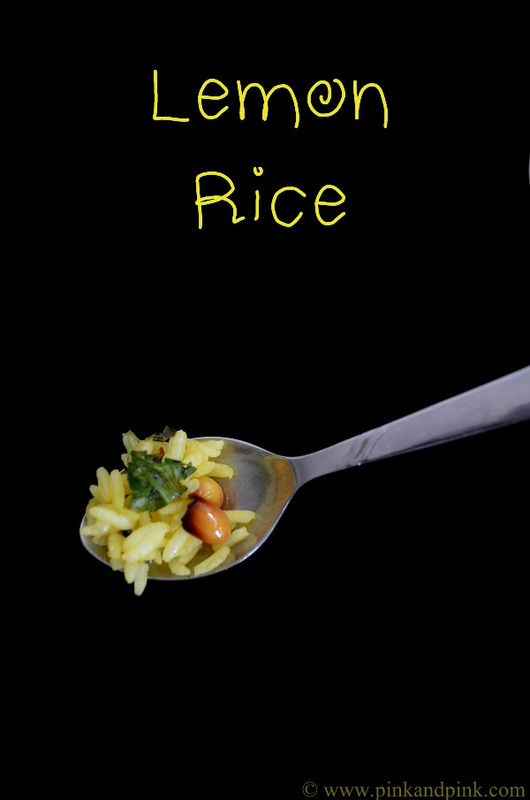 Yes, if you cook in the right way, variety rices are tastier than normal rice and kulambu combos. The best part is the time you save. Also, variety rices are perfect for lunch boxes. They will not become like cakes how normal kulambu rice becomes in the afternoon. When we pack kulambu rice, we have to pack kulambu and rice separately. Otherwise, they become like a cake(Thats how my hubby calls) in the afternoon. Now, let us see how to make lemon rice - Easy Lemon Rice Recipe. 1. Spread the cooked rice in a wide plate and cool down. 2. Heat oil in a pan. Add mustard seeds and urad dal. Once they splutter, add curry leaves, red chillies, chana dal, peanuts(groundnuts), hing. Once the chana dal turns golden brow, add turmeric powder and required salt. Add lemon juice and switch it off immediately. Mix the contents well. 3. Add the cooked rice with the prepared mixture and mix well. Add gingelly oil if required. Taste it and adjust salt if required. Garnish with coriander leaves and serve it. 1. The tanginess of lemon might vary. So, add it accordingly. No single measurement applicable for all lemons. 2. Sometimes the lemon juice might not be sufficient for the rice. So, keep some cooked rice aside before mixing it with the lemon extract. You can always add it at last. 3. Adding sufficient amount of turmeric powder is quite essential to get nice yellow color. If you feel the yellow color is not sufficient for the rice after you finish preparing, do not worry. Just heat another spoon of sesame oil(gingelly oil) or any edible oil and add turmeric powder. Mix till the raw smell goes off. Add it to the lemon rice now. 4. Never ever add turmeric powder directly as it will give raw taste to the rice and spoil the taste. Follow the above point to add more turmeric powder. 5. Remove the seeds from the lemon juice especially when you serve for kids. Remove them even before you use it as it will be difficult to search it later amidst chana dal and peanuts. 6. 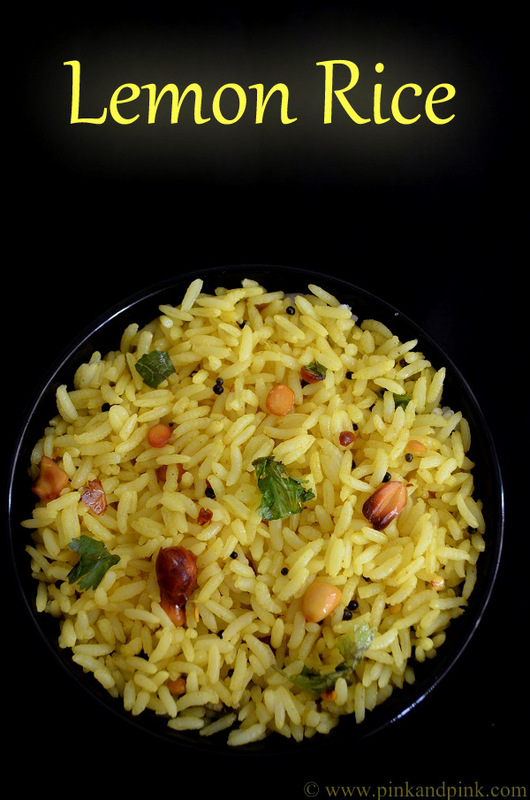 Peanuts(Groundnuts) and Chana dal are the real heroes in the lemon rice. Try not to skip it. 7. Do not worry if you do not have sufficient tanginess in the lemon rice. You can always add fresh lemon extract even after switching off the stove. The only thing is you need to have excess lemon in stock. 8. When you taste the lemon rice as soon as you prepare it, it will be a little bit more tanginess. But it will get nicely absorbed by the lemon rice in sometime and the taste will be as good as you expected. 9. Cover the lemon rice immediately after mixing at least for 5 minutes so that everything gets mixed and absorbed properly. Tasty Lemon rice is ready to serve. Hope you liked the post - Lemon Rice Recipe.